CLEMSON, S.C. (AP) Clemson coach Brad Brownell drew up the first play of Saturday’s game to get an open 3-pointer for Gabe DeVoe, partly as a way to thank the senior for four good years. It also served as a catalyst for the 15th-ranked Tigers as they ended a three-game losing streak. DeVoe scored 25 points, making four of his seven 3-pointers, to lead Clemson (21-7, 10-6 Atlantic Coast) to a 75-67 win over Georgia Tech. Shelton Mitchell returned after missing two games for the Tigers, and his presence helped DeVoe get his stroke back. Mitchell added 14 points and took away some of the defensive pressure on DeVoe, who had shot 2 of 14 on 3s in the past two games. ”His speed in transition really opens up the offense a lot – allows me to get easy looks,” DeVoe said. The Tigers ended the game on a 29-14 run after leading scorer Josh Okogie picked up his fourth foul for the Yellow Jackets (11-18, 4-12) with 11:44 to go. Georgia Tech missed 11 of its last 12 shots and turned the ball over four times in the final seven minutes to lose their seventh straight game and 11th of 12. The Yellow Jackets shot 50 percent (9-of-18) on 3-pointers – their best outing of the ACC season – but missed 13 layups, including four while Clemson went on a 14-0 run that turned a 61-55 deficit with 5:43 to go into a 69-61 lead in the final minute. Clemson led by as much as 10 early in the first half but allowed Georgia Tech to rally. The Yellow Jackets took a 58-47 lead with 10:28 left in the game. DeVoe’s 25 matched the career high he set on Jan. 28 in a 72-70 win at Georgia Tech. His final basket Saturday came as he dribbled for about 20 seconds at half court as the clock went under a minute and then buried a 25-footer as the shot clock wound down. Pastner described his team as snake-bitten twice after the game. He was talking about missed shots that rolled out, but also some calls that left three of his starters with four fouls for the final five minutes in a rotation that goes just seven deep because of injuries. Okogie scored 22 points and hit his first eight shots, but missed his last four field goals in the final 17 minutes of the game as his fouls mounted. Pastner wanted to look at video of the fouls. He thought the second foul on Okogie could have been a block and the third a jump ball. But the fourth on a DeVoe drive was the killer, the coach said. ”Whether he fouled him or not, he’s got to be smarter. I’d rather just let the guy score at that point. We need you in the game. 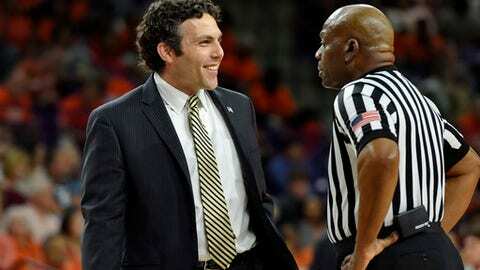 You can’t even get yourself into a gray area,” Pastner said. Brownell said starters Marcquise Reed and David Skara looked a step slow. Clemson: The Tigers are trying to hang onto something rare for them – a bye into the ACC quarterfinals by finishing in the top four in the standings. With the win, Clemson is guaranteed to be at least tied for fourth place with two games to go. In the 12 seasons since the ACC expanded beyond nine teams, Clemson has started the tournament in the quarterfinals just twice, in 2008 and 2011. Georgia Tech: The Yellow Jackets are locked in to play the first day of the ACC tournament, meaning they will need to win five games in five days. Also, without a miraculous season-ending tournament run, the Yellow Jackets will have their eighth losing record in the past 13 seasons. Georgia Tech: The Yellow Jackets host North Carolina State on Thursday. Clemson: The Tigers host Florida State on Wednesday.